When Sriracha had a bad day, Dragonlord seemed to instantly know. 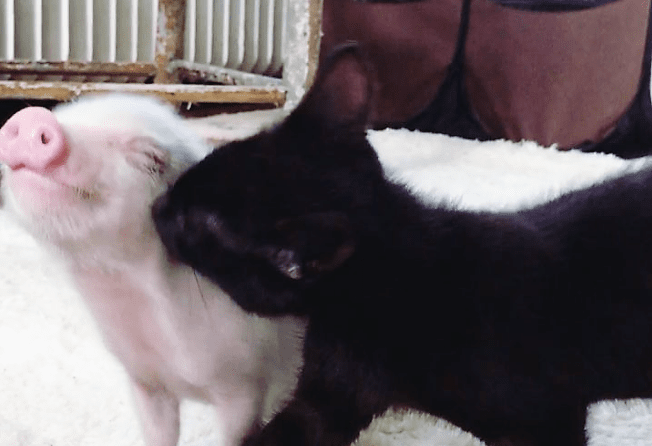 The piglet, rescued auction, when introduced to the the kitten with CH, found a true friend. When Sriracha had a bad day, Dragonlord seemed to instantly know. The piglet, who was rescued from an auction, when introduced to the the kitten with CH (short for Cerebellar Hypoplasia and, according to Life With CH Cats, it is ” non-progressive, non-contagious neurological condition that results in walking and balance problems”) found a buddy. The two developed a relationship that is truly special. When Sriracha moved out to her forever family, Dragonlord soon found himself surrounded by more kittens and it seems, has found his bliss. Ken, as usual you did a terrific job and it is always inspiring to received you messages. Please keep up the good work and best of luck!